Discussion in 'The Sports section' started by KUCIAR666, Oct 29, 2017. Malaysia's usual unpredictable weather shuffles the cards on the first day of free practice for #MalaysiasnGP, forcing riders to go out on track in wet conditions in the afternoon after the morning sun. Danilo Petrucci starts FP1 well: his race pace - medium tyre - is good and his Top Speed is the highest (328.4 km/h). When he tries to return on track for the time attack with the soft rubber, however, he has only one lap available and is unable to take that step forward to conquer the Top 10 (11th place). Petrux’s performance is better in wet FP2 as the rider from Terni ends up 5th, three tenths of a second from the front row. 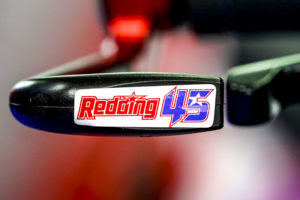 Scott Redding has to deal with physical conditions that are not excellent, forcing him to go to the Mobile Clinic after FP1. In FP2 the feeling is better but the gap from the Top 10 is still wide (6 tenths of a second). “Mixed feelings on this first day. This morning I wasn't going badly but I came back on track too late to make the best of the time attack. As a result and I couldn't stay in the Top 10. This could be a problem. In the wet we are more competitive even if there are things to solve. I hope, however, that tomorrow it will be dry to stay in the Top 10”. The first day at the Malaysian Grand Prix was dominated and affected by the weather. Rain poured early in the morning which left the track slippery, with riders uncertain about the best setup. Later in the afternoon the situation became more consistent with steady rain. In these unsettled conditions the combined classification left Andrea Iannone in 13th and Alex Rins in 22nd. At the beginning of the morning session, Iannone decided to wait a while to better evaluate the track conditions, and then took to the track with a dry setup. Under those conditions he was able to set his GSX-RR in the top ten in classification, with a best lap of 2'01.740. At the end of the first practice session he slid back to 13th position effectively exiting the “Q2” zone. Getting a better feeling with the bike in the afternoon in full wet conditions, he worked out a more effective setup that helped establish a consistent presence in the top part of the timesheet. His best time of 2'13.483 was worthy of the 9th place in the session, although it did not change the combined classification. There were more struggles for Rins who had difficulties in adapting to the unusual weather. Out at the very beginning with a wet setup, he tried to gain confidence on the circuit, without much success. His best time in the morning (2'04.381) set him in 22nd place, which is also his provisional position in the combined classification for the day. Feeling much better on the bike in the afternoon, he regained his confidence and effectiveness on the track. He was able to maintain a place in the top ten during the second session. His best lap time of 2’13.416 placed him 8th of the session, where he demonstrated an impressive pace. 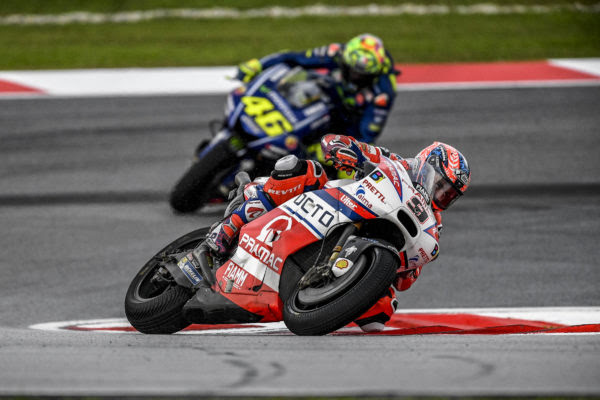 Movistar Yamaha MotoGP's Maverick Viñales and Valentino Rossi faced the hot and especially humid conditions on the first day of the Malaysia Motorcycle Grand Prix weekend. The riders had to show some patience in the morning, waiting for the track to dry, before getting fully immersed into FP1. In the afternoon, they had to cope with completely different circumstances at a full wet Sepang International Circuit. The teammates ultimately finished 4th and 12th in the combined Friday free practice results. Viñales bided his time at the start of the morning session, keeping a close eye on the live timing screens to get an understanding of the conditions. Twenty-five minutes into the session, the track had tried sufficiently and he was on his way to clock a time on slick tyres. He set the provisional 14th time on his first try but saved the best for last. He steadily worked his way up to fourth place in the FP1 rankings, with a 2'00.903s lap, 0.232s from the front. The Spaniard had the opposite tactic in the wet afternoon session. He quickly left the Movistar Yamaha box as the pit lane traffic light turned green, keen on proceeding with the work on the wet setting of his YZR-M1. He was showing a positive pace, but a small collision with Héctor Barberá in turn 15 meant he had to make an unplanned pit stop, with 35 minutes remaining. Lucky to have escaped a crash, he was able to rejoin the action soon, eager to make up for lost time. He wrapped up the session with a 2'12.878s best lap for fourth, 1.238s from the top of the standings. 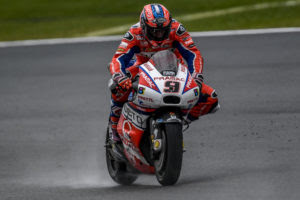 With none of the MotoGP riders improving in the afternoon on the results of their morning stint, he also holds fourth place in the combined FP classification. With the conditions being uncertain at the start of the morning session, Rossi was one of only five riders to start FP1. However, as he headed out on slicks with half of the circuit still presenting wet stretches, he came back in after his first lap. The Italian sat out some time in the pit box waiting for the tarmac to dry, until there were 20 minutes of the session remaining. Back on track he improved on his time consistently, before shifting his attention to working on the bike's set-up. He dropped a 2'01.662s best lap to finish the first 45-minute session in 12th place, 0.991s from first. The wet conditions really suited the Doctor in the FP2 session. He was a man on a mission from the moment he kicked his bike in gear. He soon featured at the top end of the provisional standings and was in a good place to fine-tune the base wet setting - knowing he would not be able to better his morning dry lap time in the wet. The nine-time World Champion ended the afternoon practice session posting a 2'13.071s best time, for sixth position, with a 1.431s margin to the leading rider. Rossi's faster FP1 time earned him 12th place in the combined practice results. "Today I felt good in both the dry and the wet conditions. I think we have good potential here in Malaysia. We still have to work on the set-up of the bike. Sepang is a completely different track to the one in Australia. We have to understand the tyres really well, even if the weather changes so much. We have to understand the tyres to be able to choose the best option for the race. I don't know exactly what happened with Barberá, I tried to make the corner and saw him go straight. We were lucky we didn't hit each other, only my clutch lever broke off, but I didn't see all the action, I just felt it on the bike. I was able to pick up my bike a little bit and didn't crash. Anyway, I was feeling good in FP2, I'm happy and let's see tomorrow. I have good confidence that we can do well in both conditions." "It was a difficult day, but this morning we were lucky because we were able to do some kilometres, some laps, on the dry. The conditions weren't fantastic, because it was a bit humid, but at the end I could push a bit and my feeling was not so bad. In the last minutes a lot of riders put in the soft rear to stay in the top-10, so I'm just 12th, but my pace was quite good. In the afternoon we could work on the wet, because the conditions were good, it was full wet. We improved compared to Motegi, and I'm in sixth position, but I still don't feel comfortable with the bike because we don't have enough rear grip. We need to improve if we want to be competitive in wet conditions." "The start of the Friday was a bit tricky because this morning the track was half dry and half wet. In these circumstances it's never easy for the riders. Luckily, we were still able to put the last 20 minutes of FP1 to good use, working on the dry bike set-up. In the afternoon we switched to working on the wet base setting. Maverick and Vale are progressing on the wet, which verifies the step we made in Australia and confirms that we are working in the right direction, even if there's still a margin for improvement. Maverick got clipped by Héctor Barberá but, fortunately, he didn't crash. He had a good pace and was feeling confident. Though the wet conditions in FP2 didn't help Valentino better his morning time and he suffered from a lack of rear grip, he showed consistent speed and will be competitive, should it rain in the remainder of the weekend. So far, we're feeling positive that we will be able to make another step tomorrow in FP3, regardless of the conditions." Johann Zarco leapt into action today in the searing heat at the Sepang International Circuit. The French star began the weekend with a strong run to 3rd in the opening shakedown on the wet but drying track. In the afternoon, the rain fell again, but Zarco powered onwards to complete FP2 in 11th. His morning time saw him conclude the day as the leading Yamaha rider, plus only 0.136 back from the top and he fully intends to continue the positive momentum tomorrow. Meanwhile, Michael van der Mark made his MotoGP debut today as he confidently began his work in Malaysia. The young Dutchman completed his first laps on the Yamaha YZR-M1 and impressed immediately as he diced with, and outpaced, some of the MotoGP regular riders. Van der Mark rounded out the day in 19th, and he will return to the track tomorrow at 09:55 local time, or 03:55 in central Europe, for FP3. The entire Monster Yamaha Tech3 team would like to send condolences to the friends and family of Moto2 team manager Stefan Kiefer, who tragically passed away last night in Malaysia. "After the first day of action, I feel good even if I fell in FP2 this afternoon. The track was slippery and we had a small issue with the rear of the bike. It was starting to dry more and more but I pushed a bit too much and fell. Nevertheless, I am happy about the first practice. The conditions were tricky, but neither the team nor the riders knew if it was fully dry so we had to take it step by step. Yet, at the end of the session, it was totally clear and possible to push. Lap after lap the grip improved and my feeling was positive. In the end, I have finished Friday in 3rd so we can be pleased with our work on day 1 in Malaysia." "It has been an amazing day. This morning the weather was not ideal so I had to wait for a bit before my first outing on the MotoGP bike. Then, when I took to the track, I immediately felt quite good and I was comfortable so this morning I stayed out and enjoyed the opening session. Then, in FP2, with the rain, I felt positive and I improved step by step. For my first day, it has been a great experience but the thing that I need to work on the most is the braking because, for me, this is the biggest difference between MotoGP and WorldSBK. The brakes are really powerful and it's more difficult to find the limit of the braking point. I will focus on this, but tomorrow I hope we have some dry track time and I just want to enjoy and improve in every session. I think I can be very happy about my first day on the YZR-M1 and I want to keep progressing." "I would like to say that today, it doesn't matter what happened on the track and how good the performances of our riders were because it is a sad and dark day. Stefan Kiefer passed away last night, and we have lost a true friend, one of us and a very competitive team manager who won the Moto2 World Championship in 2011 with Stefan Bradl. He was full of passion and energy, and his death is a huge loss for all of us. I would like the whole paddock to remember him for the man he was." 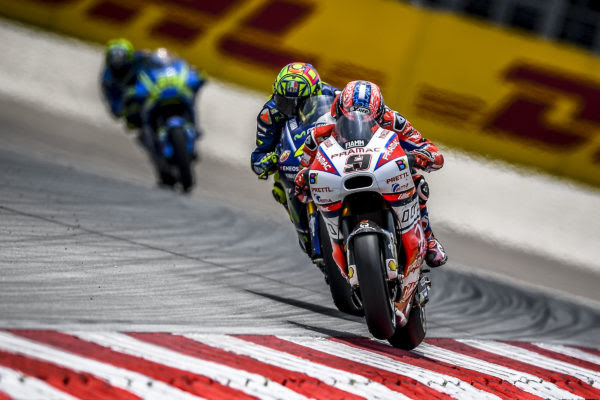 Danilo Petrucci and Scott Redding will start from thirteenth and fourteenth position respectively on the grid of the Shell Malaysia Motorcycle Grand Prix. After the rain of the FP2, Sepang’s Saturday gave to the last qualifying session of the "triple header" a nice sunshine that kept the circuit conditions constant. Danilo Petrucci takes a step ahead of the dry FP1 and finishes the FP3 only one tenth of a second from the direct qualification to Q2. The italian riders is second after the first run of Q1 but during his last time attack he didn’t manage to make that small step to pass the round. Petrux ends the Q1 at one tenth of a second from second place. 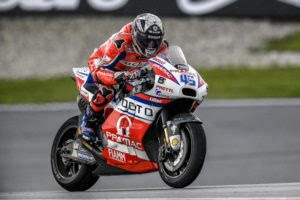 Scott Redding has to contend with the influence that has debilitated him in recent days, but his feeling with his Ducati DesmosediciGP improves lap after lap, especially in Q1. The English rider fought until the last run and ended 14th, one tenth of a second behind his team mate. “I can't say I'm happy but honestly the feeling is not bad even if perhaps we have reached a good set up only at the end of the FP4. I lost the Q2 qualifying session twice for a tenth today: it could have gone better but I think I've got a good pace so that I can stay in the Top 10 tomorroweven in the dry”. “It was tough even today for me but I'm happy about how things went. If I have to be honest when I'm on the track, I feel better but the problems come out when I’m in the garage. I am quite satisfied with this qualifying because the feeling in Q1 was positive. I hope to feel a little better tomorrow to do well in the race”. Movistar Yamaha MotoGP's Valentino Rossi and Maverick Viñales enjoyed a full-on second day of MotoGP action at the Sepang International Circuit. Today in FP3 and FP4 they continued working on their YZR-M1s in dry conditions. After they both secured places in the Q2 session, the pair went on to set some seriously impressive lap times, under the 2'00s-mark, to secure fourth and fifth place respectively on the grid for tomorrow's Malaysian Motorcycle Grand Prix. With four minutes on the clock the Doctor was back for a second run at the 5.5 km long circuit. He had time for two more tries and was determined to make the most of them. He set a 1'59.498s to take over pole briefly, but late efforts from his rivals after the flag came out relegated him to fourth position, 0.286s from first. Unable to improve on his last lap, the Italian will start tomorrow's race from the second row of the grid. Viñales approached the Q2 session with a different tactic than his teammate. 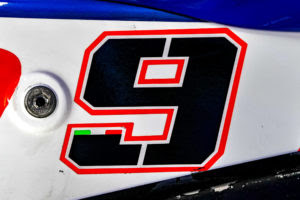 Despite the fact that the lengthy track allows little time for multiple hot laps, he waited until most of the other riders had left pit lane before stepping aboard his Yamaha. Enjoying some clear space, his first attempt saw him settle into fifth position and he quickly followed this up with a provisional front row result, posting a 1'59.673s for second place. The Spaniard made a quick pit stop with a little less than seven minutes remaining and was ready to put his head down again two minutes later, as the times dropped. He wasn't able to improve on his next attempt, but turned up the heat on his final flying lap and set a 1'59.538s to move up from fifth to third. However, a last-minute flurry of activity after the chequered flag was already out, saw him end the session in fifth place, 0.326s from the front. Tomorrow he will line up on the second row of the starting grid, right beside his teammate. "In general it was a good day, because already from this morning I felt good with the bike. Into qualifying we were still working, because the level of the top five or six riders was very close, it was very balanced, we're all the same. I tried to push, my lap was good, I rode well. The lap time was OK, I saw P1 at that moment, but after that the others improved. Starting from P4 is a good position, but we have to work on the balance of the bike because I'm not fast enough yet in some places. Like always, the tyre decision and the weather conditions will be very important tomorrow. For me it's still open which tyre to use on the front and for the rear, we have to decide if we go with the medium or the hard and also the combination between the two, it depends. First of all, I hope for good weather tomorrow, so we can try to race with the slicks." "Today's qualifying was very close, all the riders' times were very close together. We are 0.3s from first and I'm happy. In FP3 I didn't feel so well, but then we made some changes on the bike in FP4 and I felt good again. I think that for tomorrow we still have some room for improvement and that's very important. I feel really good and I think I have a clear idea on which tyre I'll use for the race. I'm especially happy because there were many races where throughout the weekend we didn't make good steps forward, but here we made great progress. We have to be very intelligent about tomorrow's race, first of all about deciding on the tyres. We have to choose the best option for our bike. In the end I think we have the package, I'm good on the brakes and feel strong there compared to the other riders, so let's see if we can get the job done tomorrow." "Today was quite full-on for the team, in order for us to make another step concerning the dry set-up of the bike. It wasn't easy, because it was another hot day at the Sepang track, which makes riding three sessions in total a real challenge, but our riders came through. Valentino and Maverick were finally quite comfortable with their bikes and were able to push hard. Vale had already shown he's feeling good on the dry when he set the fastest time in FP3. His pace has been very fast in all of today's sessions and his fourth position on the grid is not a bad result. Maverick wasn't quite as comfortable in this morning's session, but he and his crew could improve his feeling just in time for the qualifying. He'll also be on the second row of the grid, which is a good starting point. Today we were able to compare almost all the tyre choices and we have a bit of an idea about which tyres both riders will use in tomorrow's race. We'll continue to work tonight to see if we can find a way to fine-tune the balance of the bikes and find some extra time in some parts of the track. Here the weather can play a big role in the outcome of the race, so we'll have to adapt to whatever situation comes our way." Johann Zarco showed his sublime talent by clinching his third consecutive front row start today in Malaysia. The rapid French rookie blazed to a lap time that left him first in the final moments of the thrilling session until he was pipped to pole by a mere 0.017. Nevertheless, the highly impressive result places him as the top Yamaha on the grid and tomorrow, he aims to close the flyaway races with a podium finish. "It is so important to start the Grand Prix on the front row of the grid, and I even expected pole position because I was in first for a small amount of time at the end of Qualifying 2. I am happy because to be fast on a single lap is a good thing, but my pace is very competitive, so if we have dry and warm conditions tomorrow, then I think I will be able to win the race if I manage everything well. We will see what happens with regards to the weather, but I am just delighted to have this confidence which allows me to push in this way and I have high hopes for the round 17 fight." "I am a bit disappointed with the qualifying result. This morning in FP3, we made quite a solid step but, position wise, it wasn't where I wanted to be, yet we have still made progress. In the afternoon, I had an issue with the rear grip and then, on the first lap, I struggled with the new tyre. On the second outing I felt better, but at turn five, I lost the front without warning. This is difficult to accept and I am sorry to the team as we were making steady progress in every session, but a crash is not what you want. The fall was due to a number of things and the track temperature was high, plus I don't have much experience of this. Everyone was fast and this morning, you can see that I was only two seconds from the top, which was good and promising. I was hoping to make another step to the group in front of me because there are only a few tenths away. Now, we need to work because the rear of the bike is spinning too much at the exit of the corners and that's the main factor to focus on. Anyway, tomorrow is race day, and I will gain a lot of experience but I hope I can fight with some riders and enjoy my time." On the Sepang Circuit Danilo Petrucci and Scott Redding are the protagonists of a good race overcoming many difficulties. The Shell Malaysia Motorcycle Grand Prix is "wet” with as the rain starts dropping half an hour from the start. Petrux is forced to start from the last row due to a technical problem that stops him during the warm-up lap. The rider from Terni remains focused and recovers 9 positions at turn 1. In the first few laps the feeling is not the best, then his race pace starts to improve. On lap 7, Petrux overtakes Bautista and Iannone to conquer the Top 10. Three laps later he attacks Rossi and Espargaro to take 7th position before passing Redding for sixth place. Pedrosa, however, is too far away and Petrucci ends up in P6 after a fantastic comeback. Scott gets off a very good start from P14 and after one lap he was already 8th. After overtaking Smith and Rins the English rider tries to catch Pedrosa. Scott’s pace is convincing and on lap six he recovers 8 tenths of the Spaniard. However, since lap 9, the soft rear tyre doesn't help him and Scott is forced to give up positions by finishing 13th. “I'm happy with this 6th place also because it was a difficult race. The bike had a problem and I was forced to start from last place. The start was very good but in the early laps I struggled a lot. I couldn't get a lot of traction during the race but I pushed hard to get the best result. If I have to be honest, though, I think we have missed an opportunity to fight for another podium”. “My race start was very good. The feeling with the medium tyre in the warm up lap was not good so we bet on the soft rubber. I pushed a lot and the feeling was very good until halfway through the race. Then the tyre started to drop and I started losing many tenths of a second each lap. I think it was a fairly positive weekend and this gives me confidence in sight of Valencia.”. All eyes were on the skies at the Sepang International Circuit today as Movistar Yamaha MotoGP's Valentino Rossi and Maverick Viñales lined up their bikes on the grid minutes before the start of a drama-filled Malaysian Motorcycle Grand Prix. After a dry warm up session, the wet conditions for the race made tyre choice crucial. The teammates pushed hard in the wet, whilst being careful not to get caught out by the slippery conditions. They secured seventh and ninth place respectively. As the track dried and the tyre degradation started to take its toll on his rivals, the Italian overtook Espargaró for eighth place with eight laps to go. It was a signal for Rossi to set a series of personal best sectors, showing his eagerness to join the fight at the front. One lap later he overtook Scott Redding, which motivated him even further. 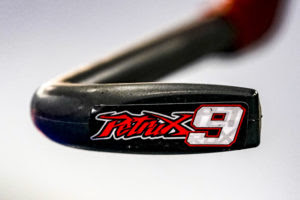 Though he came close, within 0.4s over the finish line, he was unable to close the gap Petrucci. He took the chequered flag in seventh place, 30.769s from the front. "We were a little bit unlucky with the weather because I think that on the dry we could have been competitive. We wanted to do a good race because we arrived here fresh from a podium on Phillip Island and it's good to try to stay at the top, but it rained. Unfortunately, today we also weren't strong enough with this bike on the wet. We had a lot of problems and I was struggling for more or less three quarters of the race. We need to understand the situation and try to improve and that's just the way it is. We'll see what happens in Valencia. It's another important race and a difficult track, but we'll see. We'll try to be competitive." "I thought we made a big step in Phillip Island in the wet, and actually I felt really good during FP2. We were third in the results and every lap I did I felt in a good rhythm. In the race it was a totally different feeling, I was losing the rear in the corners and couldn't lean, so it was very difficult to get a good rhythm and confidence. Anyway, I have to keep FP2 and the warm up on Phillip Island in mind and don't think about today's race too much, because we had some issues today, but we were fast in some other sessions. I think Valencia is a good track. Actually, in the warm up we found a setting that gives me a lot of confidence. I'm quite happy about that, also because I know we have a good opportunity in Valencia, as it's a track I really like and where I always have been fast. We'll see what happens and try to complete the race there in the best way possible." "We knew from the start that the weather was going to be a major factor in how today's race was going to play out. We had wet track time in FP2 this weekend and the feeling was quite positive, especially for Maverick, but today the situation was different and we have to understand the reason. The riders couldn't warm up the rear tyre until midway through the race and this cost them a lot of positions. When the feeling with the tyre got better, the lap times improved considerably, but unfortunately it was too late. We have to understand how the conditions of the track were different compared to Friday, because the bikes had quite similar settings today to the ones used in FP2. We'll put this weekend behind us and after a week off we'll focus on the final GP in Valencia in two weeks' time. Our challenge in the Constructor Championship has come to an end and the Team Title also will be very difficult to achieve, but we're still aiming to make a strong comeback, to end the season on a high note." "It was a great race and I am happy to be on the podium again. I was a bit worried about riding in the wet because when it rained on Friday, I was not fast and overall, Marquez and Dovizioso were pretty quick. Today I used the soft tyre in order to be safe but also to get some feeling and the lap times during the race were not amazing, yet, they were fast enough to lead and I opened up a gap. It was good to start the GP in this way, and even though I felt that I couldn't push anymore, I did enough to stay first. Then, when the two Ducati riders overtook me, I thought about fighting with them. Eventually, I lost too much in acceleration so I had to push a lot on the brakes. Yet, it was too risky and I lost the rear twice. I wasn't sure about what to do, however, I expected the track to dry a bit, and then I wanted to attempt to catch them, but I was limited. On the last three laps, I ran alone in third, so I decided to stay focused and the result was already pretty good so I chose to be safe and enjoy it!" "I am really happy with today's result, even though it was typical Malaysia and just before the race commenced, it rained again! The team and I changed the bike considerably compared to Friday when it was wet and we went softer on the rear. I had quite a good start, and the first half of the GP went very positively as I followed the guys in front of me and I fought with a lot of riders. I'm pleased with my performance, even if I wasn't completely happy with the bike, but it was only my second time on the YZR-M1 in the wet. In my eyes, to fight for the points and follow Maverick was really amazing. When it dried a little bit, I struggled slightly more than him, yet, I could run a similar pace. I think I lacked a bit of confidence with the turning of the bike, otherwise, I may have been able to stay with the big group in front of me. I hoped to catch them with Maverick, but I also wanted to finish the race, which I did. Overall, I enjoyed the weekend a lot and my first experience with the YZR-M1 was just amazing." "It's a great way to end these three flyaway races and the weather, as well as the track conditions, were tricky but finally, we got the podium that we were dreaming of after the one we had in Le Mans. I was really sad and bitter to have just missed out on third in Australia and I thought maybe that was the last opportunity of the season for Johann to get on the rostrum again. However, he proved me wrong today. He was fast and confident about scoring a solid result in the dry, but when we saw the rain falling, we thought the chance had gone, because the feeling on Friday in the wet was not very good. He chose the soft rear tyre, started well, got his head down and ran a strong rhythm which allowed him to be in the lead for the first seven laps. This was an incredible feeling for him but even more so for us. We knew that it was always going to be difficult to stay in front of the Ducati bikes and when they passed us, it was almost like it was the plan. Then we saw Marquez closing and I was scared because we know how fast and how much of a warrior he is. Yet, when Johann saw the gap was shrinking between himself and Marc, he pushed more and finally, Marquez gave up. This is something we have to be proud about as Marc does not often give up. A podium is an incredible reward and three consecutive front rows starts, and a near podium in Australia all mean that the flyway races have gone very positively. We can see that Johann is growing and he is so much more of a MotoGP rider than when we began the year of course. On the other side of the garage, Michael van der Mark did a brilliant job. I want to thank him because it was not easy to jump on a MotoGP bike at round 17 when everyone is fast and they know their bikes so well. Like with Broc last week, he had to discover the carbon brakes, the Michelin tyres and the electronics. Yet, Michael did a top job. He was a bit unhappy with himself after the crash in qualifying, but today he showed great determination. He had a strong start and fought with Cal Crutchlow, who is a Grand Prix winner in the wet, Iannone and he closed in on the factory Yamaha's. I must thank him for his super effort and I hope, and I think it may happen, that we will see him on the YZR-M1 in the future. Let's hope this performance will give him a special boost that will translate into a podium in the final WorldSBK race in Qatar next week. I must say thanks to the entire Monster Yamaha Tech3 team, so let's fly back home and enjoy some well-deserved rest."